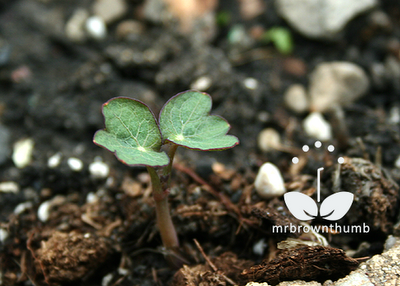 This week I finally got around to sowing my Nasturtium "Spitfire" seeds in the garden. I find Nasturtium seeds to be so easy and carefree that I can't bring myself to starting them indoors or in a seed starting kit/greenhouse like the ghetto greenhouse, newspaper pots, paper tube seed pots or even in plastic baggies. The direct sowing method is definitely the way to go with these annual seeds in my experience. 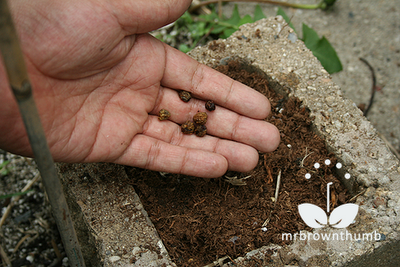 I just take one of the seeds and sink it into the ground with my index finger and move on until I am out of seeds. To give myself a challenge for the seed GROW project I started a www.GardenBloggers.com I decided to pre-soak some of my nasturtium seeds and direct sow the rest straight of out the seed packet. 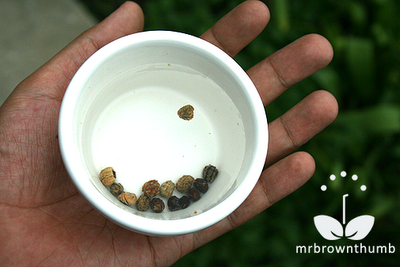 A handful of Nasturtium "Spitfire" seeds that I soaked in warm water for 24 hours before planting them in the garden. The reasoning behind soaking them before sowing seeds is to make sure that the seeds germinate, by softening the seed coating and giving the embryo a chance to emerge. I sprinkled the seeds in the same cinder blocks I used as 'containers' for the Nasturtium "Moonlight" seeds I grew last year. Hopefully there weren't any self-sown seeds in them from last year. The "Moonlight" seeds I also got from Renee's Garden and it was my experience growing them last season that prompted the seed GROW project idea. I blogged about how the seeds didn't do much after germinating and there wasn't any climbing occurring and how it wasn't until right after I complained to Renee about the seeds that they started growing like gangbusters. It was my experience growing them that got me wondering about the experience of other gardeners who bought the same seeds and how the seed GROW project came to be. Nasturtiums have been a favorite annual of mine because they are relatively inexpensive, easy to start from seed, flower more in poor soil and provide me blooms right up to, and sometimes after, the first frost of the season when everything else in the garden is starting to go dormant. The leaves, flowers and seeds are edible and decorative and I recommend them for every sized garden. Update 5/17: While walking around the garden today I noticed that both the Nasturtium seeds I scarified and the seeds I just planted without pre-soaking them had both sprouted. I would've expected the seeds that were scarified to germinate first, but I think the wet weather we had after I sowed the seeds in the garden helped the untreated seeds catch up with the scarified and pre-soaked seeds. One of the seedlings spotted in the garden today. As I was expecting, the seeds started in the cider block containers are a little taller than the ones that were planted in the ground. I attribute this to the soil in the cinder blocks being warmer than the ground this spring. I love the cinder block idea! I have a brown thumb (truly) but maybe I could do this! What a great project. so sorry to have missed out on the deadline to apply for seeds, but I think I might try to buy some and grow with you anyway. Lowe's tomorrow!! Direct-sowing is definitely the way to go, as I learned with my first attempt growing nasturtiums this year. Mine were sown under lights in the basement, and they look pretty sad. Especially since this is my attempt growing nasturtiums, I'm really enjoying everyone's project updates, and all the hints and tips. My mom has cinderblocks around her veggie garden raised beds. She plans to use the cinderblock pockets for herbs, but I think I'll suggest she reserves a few for some nasturtiums. I don't think she's grown them before either. Hi there, I too am a sucker for nasturtiums and can thank Renee for so many super ones. I found a few years ago, when I cut bouquets of nasturtium (and this means stem and leaves, not just a sprig of flower), that they soon develop roots and can be planted right out in the garden. The hummingbirds so appreciate these little gems. I planted them in the cinder blocks last year and then put bamboo stakes inside for them to climb on because my garden is all flat. Figured I could give some height and frame the entrance to the garden from the side of the house. Next time, make sure to get in on it. I think yours will be ok. When the rest of the plant starts to grow you can just trim the spindly plant growth and eat or compost the leaves. Very true. I noticed that too, especially in cool and wet weather. I noticed one fall after trimming some mounds and tossing the cutting under the stairs that they started rooting. This was in November. I had stems and blooms well into December under there. That is crazy that you had nasturtium growing under your porch in Chicago in December! Now that I know these trail, it will be cool. Kind of freaked me out last year, I didn't know nasturtiums did that,and they started snaking across the flower bed. The cinder block idea is good...I love that sort of thing, flowers coming out of buckets and blocks and wagons and such. Hi there! I have "met" you on twitter and this is the first time I have made it to your blog... I guess I am busy growing, but I have been missing out! Thanks for this post on Nasturtiums- I planted ONE packet of Renee's seeds on the top of a hill in Southern California. Well, one year later they took over the entire hill and reseeded themselves a million times over. Beautiful flowers, spicy to eat and the easiest things in the world to grow... at least in Los Angeles! Thanks for the info. I think I will pick up a pack of these "space eaters" and use them to fill in some empty spots!! I keep trying these in various spots, but inevitably the Arizona heat gets em and I don't get much at all for blooms. I still love them though, and keep trying! One year I had some trailing nasturtiums out of a seed packet that wasn't suppose to be trailing and I got freaked out too. One day they were a mound and the following evening there were tendrils across the yard. Had I known what I had I would've collected seeds from them. Please do they are awesome. That's too bad. Maybe in the fall? I've in AZ for a bit and I know your fall is nothing like mine in Chicago, but even in the fall they grow great, if not better than in the spring and summer here. I have collected some Nasturtium seeds from my community garden and I am excited to plant them in the garden in my new home. The soil in my new garden is terrible! I've read that nutrient void soil is good for Nasturtiums if you want more flowers than leaves, but how poor are we talking? I am planning on removing a lot of the soil and replacing it with a richer fill. Maybe in the place where I plant the Nasturtiums I should just mix in some compost? Thoughts? Another questions is regarding the seeds I collected. They aren't dark brown yet so I'm waiting for them to mature so sow them. Have you ever heard of people putting seeds in the dehydrator to dry them out? Do you think that would work? We're talking very poor soil. When I soil was mostly dry clay (when dried it was gray and hard-like a brick) my nasturtiums flowered better than they do now. I wouldn't amend them at all, although you really won't hurt anything by amending your soil, just don't give them any supplemental fertilizer. So happy to have found your blog. I have planted Nasturtiums for years in Alaska. They do grow sooo well there. Tried an old packet this year in Utah and germination, as expected, was light. Will plant again next year. Thanks for the info and encouragement. how long does it usually take for nasturtium seeds to germinate? Mine have been in pots in potting soil, in 7 hours direct sunshine per day (zone 10) and after 14 days I still see nothing growing!